Spring is finally here!! But you wouldn’t be able to tell that with the weather we’ve had in Bay lately. It’s cold, rainy, and gloomy. To help cheer myself up, I painted my nails a bright shimmery pink :-) I wanted to try out zebra stripes but they turned out tiger stripes. lol. Oh Well. I tried and I still love how they turned out. It’s pretty with attitude. I look forward to playing with more bright colors for the Spring season and I hope the weather brightens up too. I have mixed feelings on this one. I am big Johnny Depp fan and this was a funny movie. I guess I figured it was a kids movie. And it is, but there was a lot of adult humor that my 5 and 4-year-old couldn’t appreciate. At the same time it was silly enough for kids to enjoy. I think they were trying to reach out to all ages. Basic storyline: A lizard (Johnny Depp) – whose name is not mentioned in the beginning – winds up in the Mojave desert after his “home” (typical terrarium) shatters because it was thrown out of a car who hit a possum crossing the highway. The possum is somehow still alive and is on some spiritual journey to the “other side” (of the highway) where the “Spirit of the West” is. The lizard winds up in a town named Dirt and decides to invent a tough hero character named Rango for him to play. By sheer luck and his awkwardness he kills a hawk and convinces the townspeople that he’s not to be messed with. The mayor makes him the sheriff because he knows Rango is a phony. All Rango wants is some water but it turns out that Dirt is all out and he gets pulled into the mystery of finding the town’s missing water. First they think it’s a band of thieves, but it turns out it’s the mayor. The mayor calls on a rattle snake outlaw to take care of Rango and tell everyone that he was lying to them. Rango gets kicked out of Dirt and he heads back to the highway. Somehow he gets across without getting run over and sees the “Spirit of the West.” He gets some enlightening advice and finds how the water was being stopped. He calls on the thieve’s family (a band of prairie dogs) and goes back to Dirt to save the town. There was plenty that my boys enjoyed. Gio loved the silly Rango character. 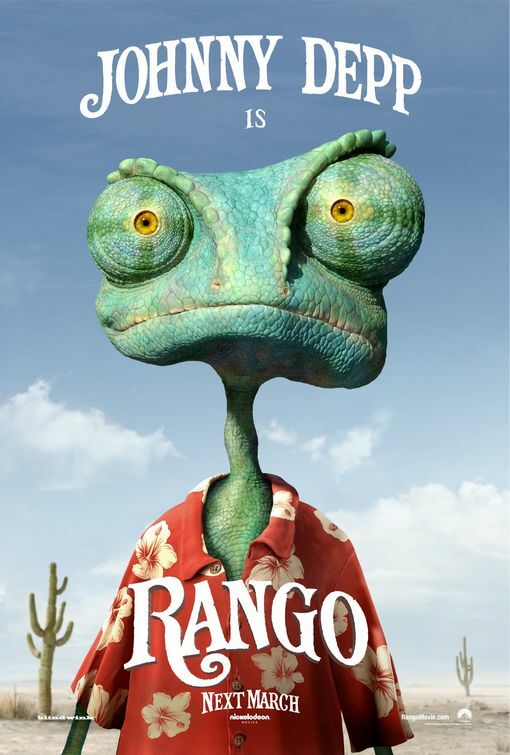 Actually the Rango character reminded me a lot of Gio. Same skinny slightly awkward movements :-) I enjoyed the adult humor. Seppe did not appreciate me laughing when he didn’t understand what was so funny – again he’s only 4. I think it’s a good family movie to go to – especially if you have kids that are 8 and up. It’s a movie about self-realization that is just a little too mature for younger kids to grasp. It is a what I would expect an animated film with Johnny Depp would be – a little strange with some deep meaning. But like I said, there is plenty for kids to laugh at and has a happy ending. All in all a 4 out 5. Being a Stay At Home Mom IS a job. A very hard one . And I Dare anyone to say different. I think a lot of people take it for granted. When someone asks me “What do you do?” or “What is your job?” I proudly say “I’m a Mom.” Being a Mom Is a full time job, even if you have what I refer to as a “second job.” You never stop being a Mom. Not everyone can be a Stay at Home Mom. Some of us have to be both Mom and Dad to our kids. And some of us are just not meant to be Stay at Home Moms. It takes a certain mentality to handle being at home with kids by yourself all day long. Back when women were expected to stay at home, I can see why many felt trapped and wanted out. No one likes being told they have to do something or be someone. Plus when you’re told that you can’t do anything else, it’s no wonder staying at home seemed like a prison. I’m sure so many women were depressed back then. But that is no longer the case. Women, have broken free from the kitchen and are now free to pursue their dreams, interests, and their heart’s desires. We no longer have to stay at home. We can be superwoman with a career and be Moms at the same time. That doesn’t mean that being a Stay at Home Mom isn’t a Job that you can be proud of and dedicate your life to. I think that in acquiring freedom from the house, some have gotten the wrong idea about being a Stay at Home Mom. I don’t have tons of “free” time. I’m not a lazy bum with no goals or motivation. I choose to be a Stay at Home Mom. My days start early – even the weekends. I get myself and two boys dressed and ready, make breakfast, drop Gio off at school, entertain Seppe while I try to clean and organize the house, pick Gio up, make lunch, do homework, entertain both boys, make dinner, give baths, ready stories, and hopefully get them in bed by 8p. I manage to get in a workout during the times Ben is home. You might as well count Ben as a kid too. I may or may not have some peace and quiet after the boys go to sleep. Still have to put leftovers away, dishes, and pick up the toys the boys left out. If I’m lucky I’ll be in bed before midnight and the boys will sleep through the night (which rarely happens – one of them always wakes me up for something). Then I get to wake up and do it all again… Add in grocery shopping, practices, games, play dates, and birthday parties. I am always planning for something. I am always doing something. It does take a toll on me. I am always tired. My only adult conversations are with Ben or short talks with parents from Gio’s class. The boys test me every day. I worry about them. I want the best for them and I’m not always sure that I am doing what’s right. I make mistakes and I lose my cool and of course feel guilty for it. But despite these challenges, I still Love my Job. I have been there for every moment. Their first smiles, first word, first laugh, when the crawled, walked, and ran. I’ve watched them learn and grow. They’ve made me laugh and cry. They’ve amazed me. They keep me young. They remind me every day just how precious Life is. And there are going to be even more wonderful moments. Even though I do think of getting a “second job” – mostly to help with finances – there is no job out there that I would trade any of these moments for. I will be there for all of them. I am truly grateful for Ben who works hard at his job so I can do mine. It is the Best Job in the world. Today was a crazy weather day. Tornado warnings for the bay area?? WTH? I watched as the rain poured down and created a white sheet that we could barely see through. The wind blew the rain around so having an umbrella was pointless. I couldn’t help but think that Earth, or some higher power was angry. I thought about the earthquake and tsunami that was affecting Japan and the rest of the world. If the world ended tomorrow, I would be happy with the life I’ve lived. We tend to focus on the bad, but I think that in the end, we would all remember the good. My life wasn’t perfect, but I had alot of great experiences. I have a loving family and great friends. I made mistakes but I learned from them . I’ve laughed. I’ve cried because I was sad, happy, and mad. My heart has been broken and mended. I’ve experienced lost and I’ve made new friends. I may not have everything that I want, but I have everything I need. My dream has come true – to be with the man that I love and have a beautiful family. Nothing else really matters. If the world ended tomorrow, I would want to be with Ben and our sons. As long as we’re all together, I know we’ll be ok. And who knows maybe we’ll be lucky to survive the end of the world. I hope that people realize what’s important whether the end is tomorrow or next year or millions of years from now. Haters. Why do we use that word? Is it because they actually “hate?” I’m sure some do, but I think most are just Critics. You know what they say – “Everyone’s a Critic” – and it’s true. We all criticize or “hate” on something. I don’t why we do it though. Why the hell do we care so much about what someone else is doing that we feel compelled to “hate” on them? Yes, we are all entitled to our opinions. But do we really need to be so concerned about what other people are doing? I think jealousy has a lot to do with it. We see someone who is better looking, has a little more money than us, or has something we wish we had, and we just have to find something about them to “hate.” They probably got plastic surgery to get that good looking. They probably did something low to get all that money or waste their money on materialistic things. So? Who cares? Why care? Why judge? How does what they do really affect you? What gives you the right to judge anyway? Yeah, so you don’t agree with their choices. Fine. Have your opinion and move on! And remember – it’s your opinion and no one else has to agree with you. Don’t try to impose your opinions and spread your “hate.” I wonder what the world would be like if we all just minded our own damn business and focused on our own happiness. I think it it would nice if we were happy that someone else is doing well or blessed. Hey, I’m just as guilty as the next person of being a hater. Lol. But after all that’s going on with the world these days, it just seems like a complete waste of energy. I accept that I am not a super model and that I am not a billionaire. Good for those people who are gorgeous and rich. None of us are perfect so no one has the right to judge.